Changing Minds Foundation is a nonprofit organization that helps parents of children and adults with Down syndrome understand and be aware of the latest research breakthroughs and treatment available. 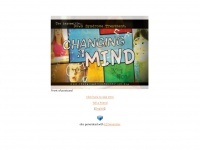 Keywords: Changing Minds Foundation down Syndrome Treatment for Learning and Memory. 2. Tell a Friend /docu­ments/tell_friend.php?url=../index.html&la..
2 links pointing to Changingmindsfoundation.org were found. The most important links to the website are from Noosfromthelastfrontier.blogspot.com and Changingmindsaboutdownsyndrome.blogspot.com. The sites /documents/pg.html and /success_stories.html are frequently referenced by external sources. The table shows the most important links to Changingmindsfoundation.org. The table is sorted in descending order by importance. The table shows websites of Changingmindsfoundation.org, which are often linked by other websites and therefore they are classified as important content. The web server used by Changingmindsfoundation.org is run by GoDaddy.com, LLC and is located in Scottsdale, USA. On this web server 68 other websites are hosted. The language of those websites is mostly english. A Apache server hosts the websites of Changingmindsfoundation.org. HTML 4.01 Transitional is used as markup language on the webpages. The website does not specify details about the inclusion of its content in search engines. For this reason the content will be included by search engines.